Sony hasn’t exactly been coy about its support of indie developers for the coming generation, and for good reason. After a year of buildup, with the gaming giant showing off its indie lineup at convention after convention, the PS4 finally launched. And to help kick off the influx of independent games, it launched day and date with Contrast, a 3D platformer with a shadowy twist. This inaugural title from Compulsion Games allows players to jump between the real world and that of the shadows, essentially creating both 3D and 2D planes to explore. And while Contrast might come to the table with a healthy serving of creativity, its aftertaste is less than perfect. Contrast is set in a rather surreal interpretation of the 1920s. Using a noir art deco visual style, the characters and the world they inhabit carry a certain visual flair that’s both unique and fun to watch. The story woven into this jazzy world follows a young girl named Didi in her adventure to seek out her estranged father. Accompanying her is Dawn, whom the player controls, and she is the one with the magical shadow powers. Able to switch between the normal three-dimensional world and the 2D shadow plane, Dawn helps Didi in her quest, which mostly involves a variety of puzzles. These can range from simple light manipulation, to more traditional platforming sections in which the player is switching between the two worlds. Shifting itself can range from being amazingly fluid and intuitive to being a bit of a clunky mess, and this is largely due to the wide variety of puzzles. The more guided experiences can create quite a satisfying progression between the 2D and 3D which feels unique, and looks great to boot, as a more muted sepia filter takes hold whenever you become your shadow self. But puzzles which require the player to manipulate objects in the foreground to alter shadows themselves can easily lead to choke points which automatically pop Dawn back into the real world. These tend to only serve as minor hiccups, as the checkpoint system is very forgiving, but they pull you out of the puzzle solving experience in a way that always feels cheap. It’s also not always clear what is a tangible platform or shadow. Occasionally as my momentum was building, with Dawn weaving between the two worlds seamlessly, I’d end up leaping toward a ledge I couldn’t land on. Or I’d reach a room unsure of where to go, only to discover a hidden dimly lit corner which required a bit of two-dimensional shimmying. Nothing too egregious was ever encountered, but the platforming in Contrast is definitely a bit rough around the edges. I also found myself wishing there was more of a soundscape to the game. Many of the dark alleyways or ornately designed buildings of Contrast leave the player in complete silence, or with only the faint sound of music in the distance. Especially considering the period inspirations for other aspects of the game, a more fully fleshed soundtrack seems like a natural development, but many environments were left feeling barren with no sound but Dawn’s footsteps. All of this, however, should not deter you from investigating the intriguing world of Contrast. Didi’s story, while never taking too dark of a turn, does have a very personal edge. A few supernatural story bits can be discovered through collectibles, but the main plot point is that of Didi and her absentee father. 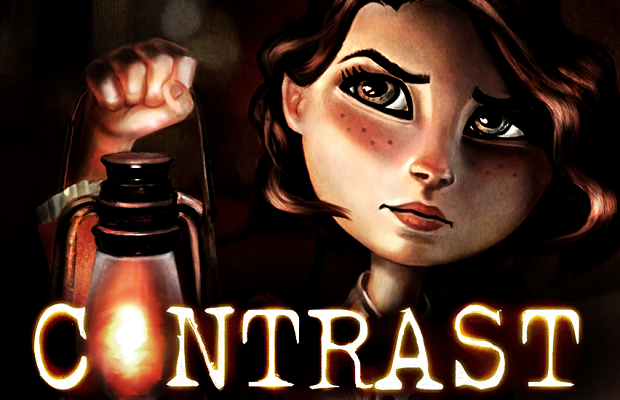 Contrast will try repeatedly to pull at your heartstrings, with mixed results. Certain scenes late in the game can come across as a bit heavy-handed, but I admire the dedication to such a simple and grounded series of events. Many times throughout my playthrough I was reminded of Papo & Yo, another indie 3D platformer with a similarly personal inspiration, but Contrast takes a much more dialogue heavy route. Contrast has a genuinely interesting core mechanic wrapped inside of a mildly psychedelic 1920s jazz club motif. When the dimension hopping works well, it can feel smooth and effortless. Unfortunately, Contrast is also noticeably uneven. The game as a whole, however, blends together a variety of aspects and unique puzzles to create something just greater than its numerous problems. Contrast was developed primarily by Compulsion Games and published by Focus Home Interactive. A PS4 copy of the game was purchased by the editor for review purposes.